This cabin is a real gem. 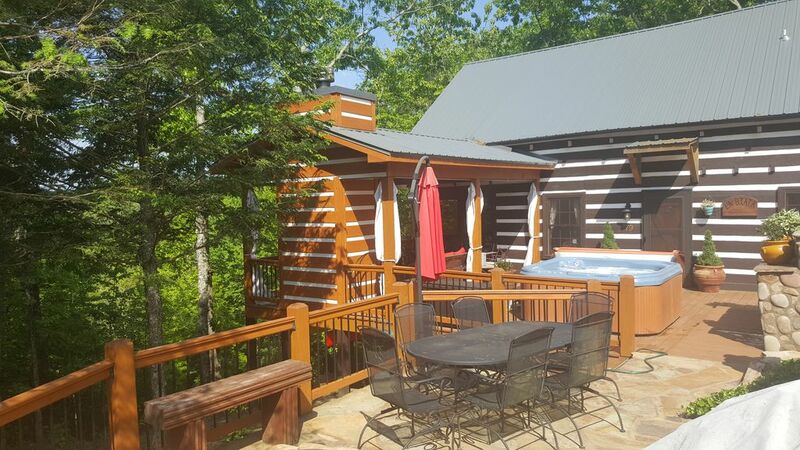 Located in Cherry Log, GA, it features 2 Bedrooms (plus a loft with 4 twin beds), and 2 bathrooms, making it perfect for families or for a nice double date weekend in the mountains. The master bedroom has its own private bathroom. You’ll love the hot tub and the main level exterior is equipped with a fabulous functional stone fireplace (wood burning). This area seats up to 8 people, making it a great place to have a meal outside or just enjoy some drinks with friends and family. It has its own propane grill, dining table for 6, and rocking chairs. All in all, you won’t find a better place to enjoy the tranquility of this mountain setting. •	Clean linens - Two towels (Body, hand, hand) per person will be left out for use. •	We suggest Guest(s) bring personal grooming items, grocery items, specialty items and any unique or important items vital to your vacation. toilet, combination tub/shower, Mainlevel. Quality towels provided. Both Bathrooms are a combination tub/shower. And initial supply of paper products and hand soaps are provided. Quality towels are provided. 1) Our GPS took us straight to the cabin, downtown, hiking trails with no problem at all! 2) La Biata was so much more adorable/cozy/nice than we had imagined! 3) We were really looking forward to using the hot tub but we could just not get it to ever get anything more than a lukewarm, not sure what was up with thath. 4) This cabin really does have a beautiful view! 5) We drove an SUV and a sedan up the mountain and were perfectly fine, it was really muddy from the rain but the drive was still perfectly fine. Our family really enjoyed the cabin. The outside area was a great place for us to eat dinner and enjoy the hot tub at night. Lovely time. Nice but outdated some but had all we needed. We stayed at LaBiata in mid February 2019. The host was very helpful by telling us prior to arrival that GPS would not work and provided us with explicit directions to the cabin from the bottom of the mountain. Upon arrival we found the cabin to be very quaint and cozy. It was very clean and well equipped. The view from the living room and upper bedrooms was spectacular! We attended a wine tasting and vineyard tour at Bear Claw which was lovely and also visited many nearby restaurants which were all great; The Cellar, Treo and Harvest. I would highly recommend LaBiata to anyone visiting the area. 5 stars for the host as well! We had a wonderful time and plan to book again. We had a wonderful time at this cozy cabin. The fireplace and hot tub were so nice and this place isnt too far away from downtown Blue Ridge. Come and visit Blue Ridge, Georgia’s favorite mountain town, where uptown shopping and dining meet small town charm. Get acquainted with great restaurants, stylish shops and galleries, hiking trails, waterfalls, beautiful mountains and friendly people.